Let’s face it; the idea of carrying out maintenance work is rarely a welcome one – especially as a senior manager. For a start, you risk losing revenue while work’s being carried out. Then there’s the stock management and logistics to think of too. It’s a lot. But when you’re dealing with a warehouse that’s temperature controlled at -21C, you risk facing all these problems and more. 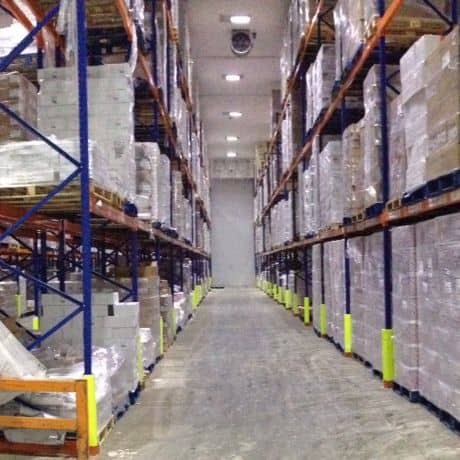 When leading UK bakery experts Delice de France decided to replace the standard sodium and fluorescent lights at one of their major storage and distribution centres in Southall with LED alternatives, Sheffield’s Constellation Lighting were happy to help. The improvements would help lower the electricity bills at the centre, whilst also proving to be better for the environment. And by working closely together, Delice de France and Constellation Lighting were able to come up with a solution that delivered outstanding results all round. The improvements involved replacing 110 sodium lighting units with LED alternatives in the cold storage area, as well as 44 fluorescent lighting units with vapour proof LED fittings in the loading bays. The installation teams at Constellation were able to complete the fittings quickly and with minimal disruption to the warehouse – in fact; they worked in an average temperature of -21C whilst installing the lights in the cold storage area. So what were some of the factors in switching to LED lights? Well, generally speaking you can lower your energy costs by around 70%, starting as soon as the switch is made and you start using the lights. And in this instance, they were more suited to the refrigerated storage thanks to their ability to operate well at lower temperatures. Plus they barely generate heat so maintaining a consistent temperature is easier – meaning the cooling system wouldn’t have to work so hard. “The decision to introduce LED lighting into our warehouse and distribution areas represented a significant investment in the company. However, we are already noticing the difference both financially and in the working environment. We anticipate that within 14 months of the installation, we will have recouped the money invested in this technology. Not only that, it is very important to Delice de France that we have reduced our carbon footprint”. Instant start up – in just 100ms, Delice de France get 100% light. Reduced maintenance costs, thanks to a lifetime of up to 100,000 hours. There’s less glare for forklift drivers, as the lights use optical lenses instead of reflectors. All light generated is directed to where it’s needed. Pick-rate and productivity are increased, as ‘white’ light is better for reading labels. It’s also easier to work in and more comfortable for the workforce. If you’d like to find out more about our LED lighting systems and our installation process, call us now on 0114 247 9900.